6 ft.(Short) HOME-DOME (HD-6S), Kosmos Scientific de México, S.A. de C.V. 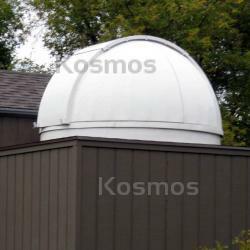 Complete ten foot diameter PRO-DOME fiberglass observatory designed primarily for stand-alone installations. Includes dome quadrants (4), rear cover, shutters (2), dome support ring (4 pieces), 12' high base ring (6 or 4 pieces, with or without molded semi-door section), locking hardware, special fittings, and all hardware (stainless steel bolts, etc. ), caulk, and instructions for construction and operation. Center height of dome plus base ring is 6 feet. DELIVERY SCHEDULE OF THIS ITEM IS ABOUT 8 TO 14 WEEKS AFTER RECEIVING A 50\\% DOWNPAYMENT. SHIPPING COST WILL BE CALCULATED HAVING YOUR FULL ADDRESS. THIS ITEM CANNOT BE PAID WITH CREDIT CARD (CAHS OR WIRE TRANSFER).